Everybody has to start someplace. This two-day seminar will acquaint attendees with the basic technology and vocabulary of ultrasonic plastics assembly, as well as covering the basics of the various other thermoplastics assembly processes offered by Dukane. 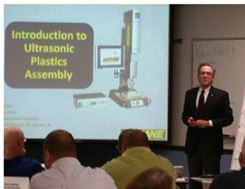 Topics covered in Introduction to Ultrasonic Plastic Assembly include theory and practice of the various thermoplastics assembly processes, basic physics of ultrasound, principles of tool design and manufacture, thermoplastic materials and part design, basic process control, and basic troubleshooting. This Application Setup and Troublesooting hands-on workshop is intended to equip attendees to set up and adjust ultrasonic equipment for optimum production on the plant floor. Attendees will get further in-depth training in determining appropriate amplitude, force, weld parameters, trigger setting, and physical installation of tooling for ultrasonic welding, staking, and inserting. Attendees will be assigned to teams that actually set up various machines running various applications under the watchful eye of our applications lab personnel. Emphasis is on developing thinking skills needed to understand and anticipate what effect each parameter has on the welding operation, not on setting up any particular machine or application. This two-day seminar is offered at the Dukane headquarters facility in St. Charles, Illinois, USA (Chicago). Fee includes sessions, learning materials, two lunches and one dinner. Transportation, lodging, and other meals are the responsibility of the attendee. Limited to 40 attendees. Take a 3rd day of training with our one-day Large Parts & Application Welding Seminar. Additional class fee required.